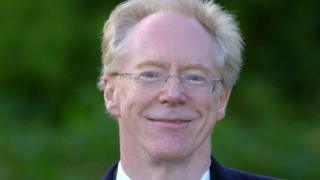 A former Cambridge University fellow who apologised after 10 students complained of "inappropriate sexual and sexist" behaviour has "withdrawn permanently" from his college. Ex-Trinity Hall fellow Dr Peter Hutchinson stopped teaching in 2015 after an investigation and was to have no further contact with students. He later apologised for his behaviour. Although he retained an advisory role he has now left, the Cambridge News reported. The college did not say why. The non-stipendiary fellow admitted commenting on female students' appearance in his tutorials over several months in 2014 and 2015. Earlier this month he issued an apology for the "thoughtless" comments which he said he now realised "caused offence". The former German lecturer stopped teaching in 2015 and was to have no contact with students following the investigation. However, he remained at Trinity Hall in an advisory capacity in its investments committee, the university said. It has now confirmed Dr Hutchinson has left the college completely. In a statement sent to the BBC, a Trinity Hall spokesman said: "We can confirm Dr Hutchinson has withdrawn permanently from any further involvement with college affairs, including from his role on the finance committee. "He will not be present in college at any time in the future." The university would not say who took the decision, or why it had been made. Nor would it comment on reports in the local press that Dr Hutchinson had "breached the sanction placed on him in 2015, after attending social events where students were present".